Iron Chef Morimoto forges an imaginative path West. : In a cement and wood contemporary cavern facing the Napa River, the chic set adorns buttercup loungers for cocktails and saké in a living room that morphs on its fringes into formal dining space. There is a sense of objects being flung outward and frozen: century-old gnarled Argentine zin vines spread over the bar like a family tree, salvaged timber is recast as free-form barren shelving, and bulging ceiling lamps mimic wine casks in a surreal state of coming apart. 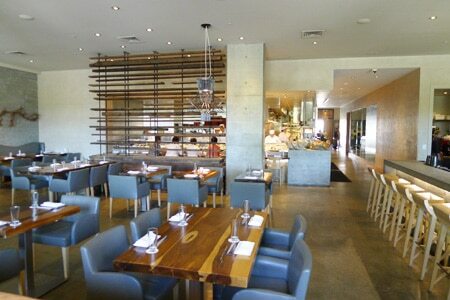 This dynamism reflects the flux and imagination from chef Morimoto's kitchen. A mini spackling tool is used to nudge toro tartare from its wood frame and combine with a sextet of condiments from nori paste to crispy rice. Wagyu beef comes as tartare with teriyaki foam, poached quail egg and pickled cauliflower, or as hot oil seared carpaccio with yuzu soy. Mains may include sous vide-and-seared New York strip with electric orange ume sauce or carbonara of sea urchin, udon, smoked bacon, poached quail egg and peas. Sushi, a raw bar, and noodle bowls add to the dizzying menu. Submit to stellar pairings of wine and premium saké, and playful desserts such as ginger cookie ice cream on raspberry chocolate sesame cake with “magic shell” sauce.